Ahead of its release into the nation’s tills, wallets and bank accounts on 13 September, the New Fiver is going on a UK-wide tour and will be on display at Southend-on-Sea’s Adventure Island on Thursday 18 August. The New Fiver is the first Bank of England note to be printed on polymer, a thin flexible plastic and will feature the instantly recognisable face of Sir Winston Churchill. The New Fiver Roadshow arrives at Adventure Island on 18August and from 11am visitors will be able to see and touch the distinctive new notes, learn how they are made, and find out why they are better than the previous ‘Lady Godiva’. Sharp-eyed history buffs will note that the time on the Elizabeth Tower (AKA Big Ben) of the Houses of Parliament is at 3pm. This is a reference to the time that Churchill delivered his famous “I have nothing to offer but blood, toil, tears and sweat” speech in the House of Commons on 13th May 1940. There’s also a background image of the Nobel Prize medal which he was awarded in 1953 for literature, together with the wording of the prize citation. 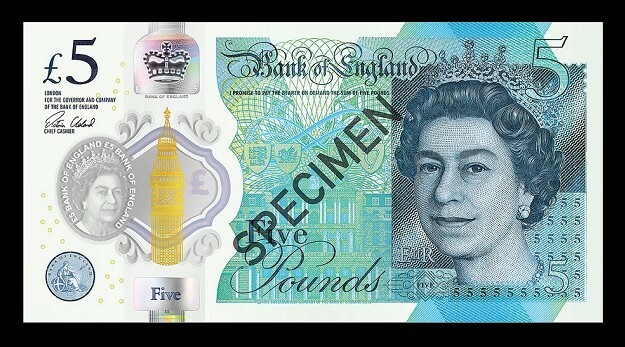 The New Fiver’s security features include a see-through window featuring the Queen’s portrait, the border of which changes from purple to green. There are also holograms on the front of the note, one which contains the word ‘Five’ and changes to ‘Pounds’ when the note is tilted and another of the coronation crown which appears 3D and multi-coloured when the note is tilted. When the New Fiver is issued the old paper £5 notes will be gradually withdrawn from circulation as they are banked by retailers and businesses. They will eventually cease to be legal tender in May 2017. The new polymer £10, featuring Jane Austen, will enter circulation in summer 2017 followed by the J.M.W. Turner £20 note by 2020.